This summer dormant California native fern has light green, leathery, upright fronds about 12-15" tall. It spreads readily, but not invasively. The generic name, Polypodium, is from the Greek words polys meaning 'many' and podi meaning 'foot.' It refers to the numerous knob-like branches of the underground stems. The specific epithet, californicum, refers to the plant's geographic origin. 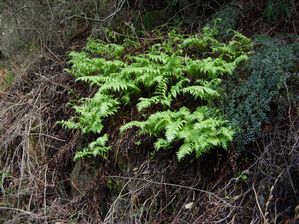 California polypody can be found from the foothills of southern California through the Coast Ranges and Sierra Nevada foothills to Humboldt and Butte counties. It's common on moist, rocky soils and crevices at altitudes below 4,000'. 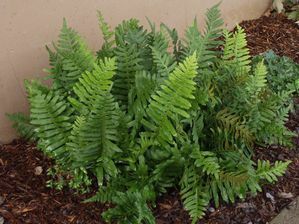 California polypody produces leathery, light green, upright fronds that are about 12-15" long. The fronds sprout from rhizomes (underground stems) in fall or winter in response to cooler temperatures and rainfall. California polypody will tolerate some morning sun, but prefers a shady location. In the wild, you'll often see large drifts of it along banks under oaks. California polypody's tolerant of many soil types, but needs good drainage otherwise the rhizomes (underground stems) will rot. California polypody doesn't seem to be prone to any diseases. In the nursery, we've found that snails like the fresh tender frond shoots as they unfurl in fall/winter. California polypody is summer dormant; this is its natural survival mechanism for coping with our long dry summers. So don't worry when the leaves start to turn brown in the summer; the plant isn't dying, it's just going dormant. It'll spring back to life in winter in response to cooler temperatures and rain.